Having a photo camera and basic processing of camera shots is something that almost any person does. And always stuck with the same problem: images in native camera’s format are simply not usable, because RAW format is not supported by standard applications and services. 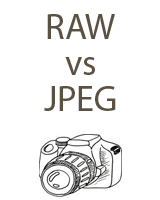 RAW is used for recording shots from camera lens because they provide the best quality of image, not impacted by any compressors, encoders and other tools - the whole matrix of pixels is purely coded to digital form. To adapt such images for sharing, printing or editing, they should be converted to some more common format, such as JPEG, PNG or other. The biggest problem here is converting RAW camera shots to a common format and saving the optimal image quality with minimal losses. 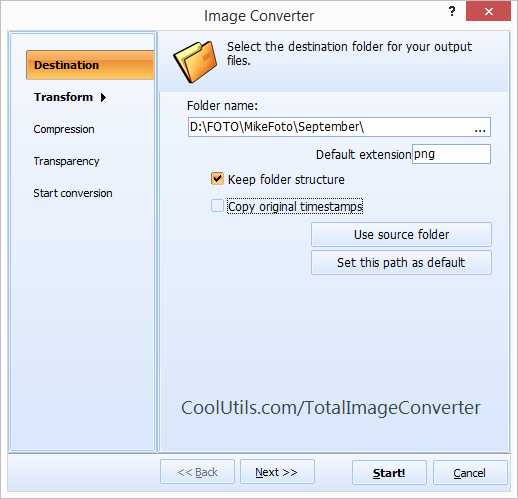 This task is excellently done with the help of Total Image Converter from CoolUtils. The program is positioned by CoolUtils as a universal image converter that supports all possible graphic formats used today. It is a handy solution for image conversions with add-ons for comfortable images management. On the left the folder tree is placed, and everyone can navigate through the folders to find the one with source images for conversion. As opposite to other converters that have browse popups, here you do everything in one window. Files of selected folder will be displayed in the central tab in thumbnail or list view. If your camera is connected to computer, its memory drive will be also available through the program’s navigation tree. This is very convenient, as you do not have to copy-paste camera shots to local memory storage before conversion. This way it saves your time and memory space. The list of supported formats is located on the top, in the toolbar. There are about 30 formats supported. The most popular ones are listed right on the top, the rest is hidden under 'Other' dropdown. Each format has its own parameters, and Total Image Converter provides ability to adjust every option supported by this or that format. This is essentially important for professionals who often need to gain the exact formatting of their photos. However, this program is a great chance for beginners to improve the quality and style of their graphic files, as all these options are provided in comfortable and easy-to-manage way. 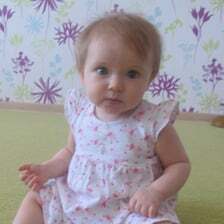 If using these options, the program will not change format of initial photos, it will save the changes in native format. If a user needs to edit image and convert it to another format, he can do this simultaneously using conversion wizard. If user needs to convert some photo quickly from the desktop, he even doesn’t need to launch the application. There is a ‘Convert to’ option in the right-click file menu that appears there after Total Image Converter is installed. Also RAW files can be converted from the command line. As a rule, a RAW converter is given to a customer in the package with the camera. Native RAW converters are highly limited in terms of image adjustments, data conversion speed and supported formats. User can spend hours on converting all his photos using the native application. Total Image Converter is much more advantageous in this sense. Expensive RAW converters like Adobe Lightroom ($300) or DxO Optics Pro ($170 - $300) feature very complex user interface, completely hard for beginners. User can simply get lost in all options and will not be able to produce effective conversion without professional graphic design skills. 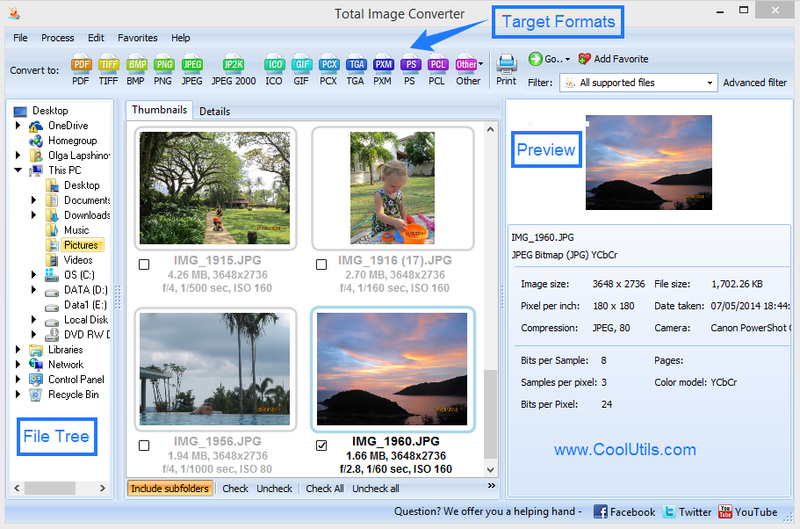 The price of Total Image Converter is only $24.90, and it does the same job in far easier way. Of course it may lack some specific options available in elite converters, but that is why it costs 10-20 times less. With Total Image Converter you can choose any graphic format for your digital photos, adjust colors, compression, size and protect from unauthorized sharing - all done in bathes. All this costs only $24.90 for lifetime use. It is shareware, provided with 30 days trial period. The trial version features the full set of formats and options, users are free to play with their RAW photos and check how different conversions influence on quality and size. CoolUtils guarantees lifetime free support and upgrades for all customers who purchase the license.